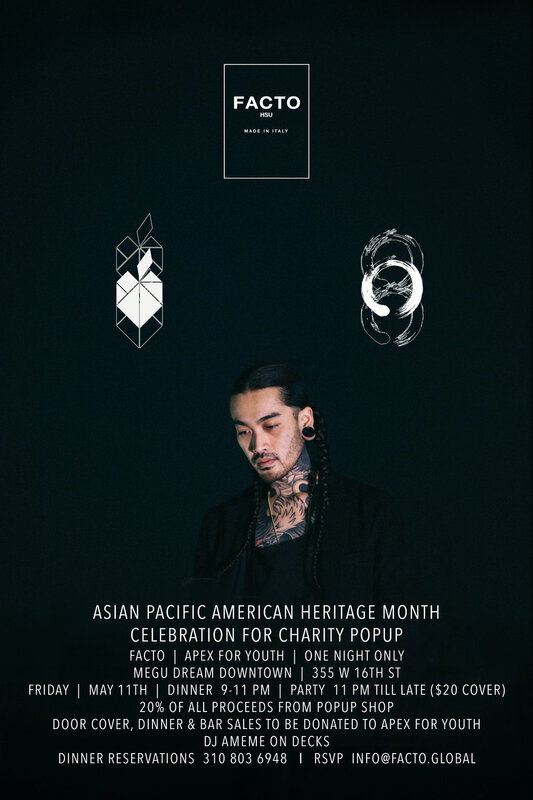 FACTO celebrates Asian Pacific American Heritage Month with ONO NYC to benefit Apex for Youth, Friday, May 11th at Megu Dream Downtown. The experience begins with dinner and the opportunity to shop the FACTO popup as the Afro House sounds of DJ Ameme keep you dancing late into the evening. The popup shop will feature the newest collection of FACTO sneakers as well as limited edition long sleeve t-shirts commemorating the event. 20% of all proceeds of sales from the popup shop, door cover, dinner and bar will be donated to Apex for Youth. Call (310) 803-6948 to make dinner reservations. Apex for Youth recruits working professionals to volunteer and become positive role models who inspire youth to expand their horizons and envision what is possible for their lives. Through mentoring and educational programs that serve students from 1st to 12th grade, Apex volunteers guide and support youth to become confident, be ready for college and give back to the community. AMEME is a DJ and producer based in Brooklyn, NY. It was the rhythms of the African drums drawn from his early life in Benin, West Africa that would inspire AMEME to enter the world of music. Living in New York for a decade has allowed him to develop his unique style, a seamless blend of electronic music and African Rhythms. His current residencies and past gigs include: House Of Yes, 1Oak, Output, Gospel by Babel, Paul's Baby Grand, Goldbar, Casablanca, Schimanski, the new Williamsburg Hotel and many others. ONO NYC is a weekly supper club hosted at the acclaimed Megu restaurant in the Dream Hotel, Meatpacking District. Its purpose is to provide a premium dinner and party experience for like-minded, up & coming entrepreneurs, influencers and creatives. I had the pleasure of meeting Fat Joe a couple weeks ago. No small honor to have your shoes appreciated by someone you've been listening to since high school. Victor Hsu is the founder of new luxury sneaker brand FACTO. With the collection in it's first season, FACTO has been received with great success, selling in key stores around the world including at Level Shoes here in Dubai, as well as being showcased as part of this year's Sole DXB concept space Early Retirement. We managed to speak with Victor Hsu who told us how his journey in shoes began, from Director of Marketing for JUMP to independently living in Japan and creating his brand. He delves into his upbringing, his education and his muses - the "slightly badass older gentlemen" of Tokyo.